Cerebrospinal fluid (CSF) is a clear, colourless liquid that bathes the brain and spinal cord. While the primary function of CSF is to cushion the brain within the skull and serve as a shock absorber for the central nervous system, CSF also circulates nutrients and chemicals filtered from the blood and removes waste products from the brain. Examining the fluid can be useful in diagnosing many diseases of the nervous system, including MS.
A lumbar puncture is a diagnostic test that involves removing and analysing a sample of CSF. A lumbar puncture takes about half an hour under a local anaesthetic. A long, thin, hollow needle is inserted into the base of the spine (the lumbar region refers to the section of the backbone below the ribs and above the pelvis) between two bones in the lower spine and into the space where the CSF circulates and a quantity of cerebrospinal fluid is drawn off. One to two tablespoons of the fluid are then withdrawn. You can expect to experience a level of discomfort during the procedure which may include headaches caused by the removal of a sample making a drop in pressure in the cerebrospinal fluid. This usually lasts for no more than 24 hours but can persist for longer. To reduce the risk of headaches it is suggested that the individual lie flat for at least six hours after the procedure and drink plenty of water. How can a lumbar puncture can help diagnose MS? 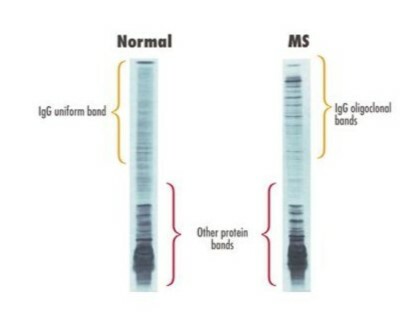 The CSF of people with MS usually contains elevated levels of IgG antibodies as well as a specific group of proteins called oligoclonal bands. Occasionally there are also certain proteins that are the breakdown products of myelin. These findings indicate an abnormal autoimmune response within the central nervous system, meaning that the body is producing an immune response against itself. White blood cells – the number of white cells in cerebrospinal fluid of people with multiple sclerosis is usually up to seven times higher than normal. If the count is even higher than this, it is probably due to an infection of some sort, such as Lyme’s Disease, and not MS.
Oligoclonal bands – the immune system produces antibodies to fight infection. In MS, antibodies cross the blood-brain barrier and attack the myelin surrounding nerves. As a result, the level of antibodies in the cerebrospinal fluid of someone with MS is higher than it should be and is higher than the level in the blood, a sample of which is also analysed. The test that shows the presence of antibodies is called electrophoresis. A sample of fluid is placed on a gel and voltage is applied. This causes antibodies of the same size to bunch together, forming visible ‘bands’. One band (monoclonal) in the cerebrospinal fluid is normal. The term oligoclonal bands refers to the presence of two or more bands and shows the presence of disease activity. Whilst this doesn’t necessarily mean that someone has MS, more than 80% of people with MS do have oligoclonal banding in their cerebrospinal fluid. Why are other tests also needed? An abnormal autoimmune response in CSF is found in several other diseases, so the test is not specific for MS. Conversely, some 5-10% of patients with MS never show these CSF abnormalities. Therefore, CSF analysis by itself cannot confirm or rule out a diagnosis of MS. It must be part of the total clinical picture that considers the findings on the person’s history and neurologic exam, other diagnostic procedures such as evoked potentials and magnetic resonance imaging (MRI).